Fried chicken and waffles. 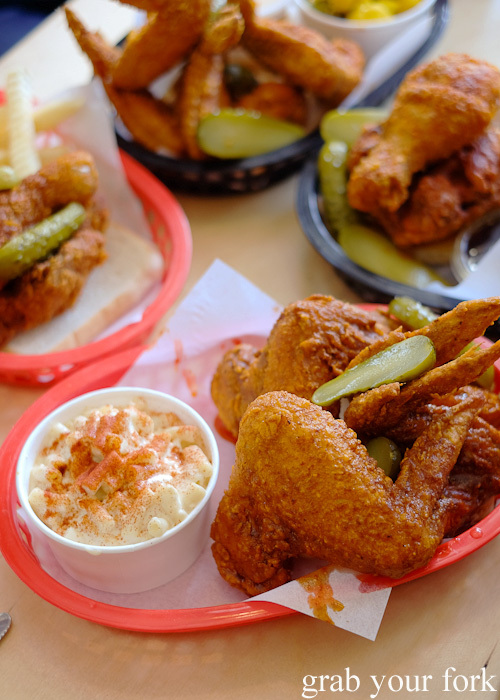 If there was one place high on my list when I visited Melbourne, it was Belle's Hot Chicken. 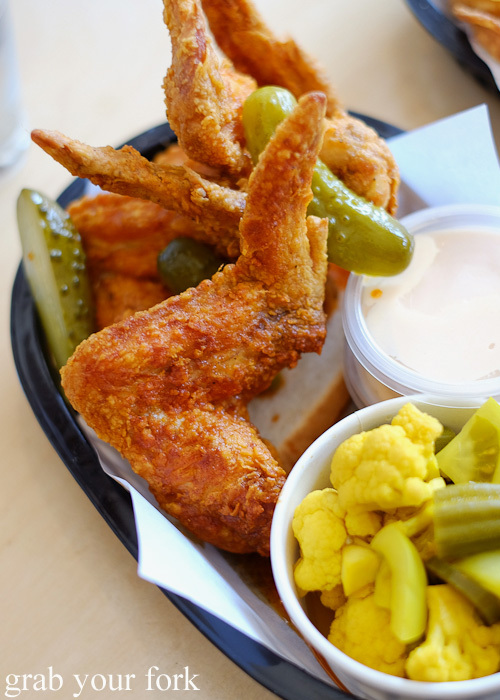 The former Belle's Diner has been revamped into a place of worship for all lovers of Southern-style fried chicken. 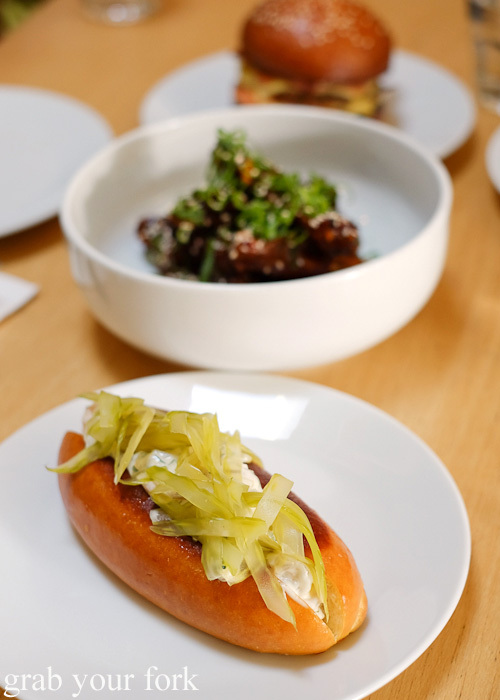 In the kitchen you'll find chefs and co-owners Aaron Turner (ex-Loam) and Morgan McGlone (ex-Husk in Nashville, Tennessee). 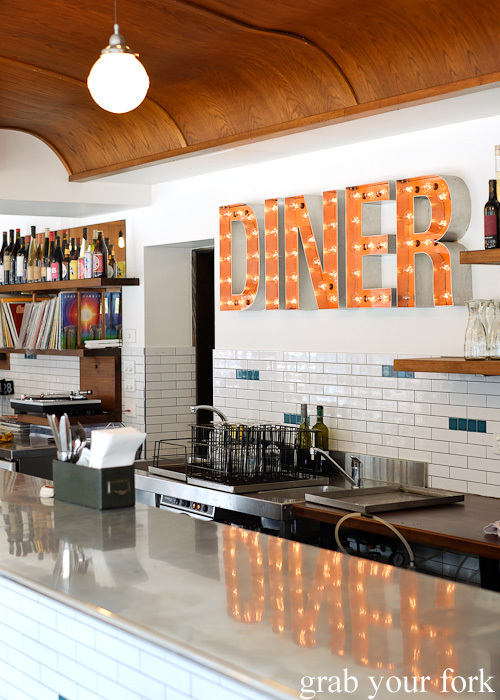 They've still kept the Diner lights from its former incarnation, but the menu is purely focussed on fried chicken. You can order wings, tenders or dark meat. If chicken's not your thing, they have fish and mushrooms too. Each chicken/fish/mushroom order comes with your choice of sides. We were a little bedazzled by the choices that included coleslaw, potato salad and Almost Arnold's beans but ended up getting the Old Bay fries, mac and cheese and mixed pickles. 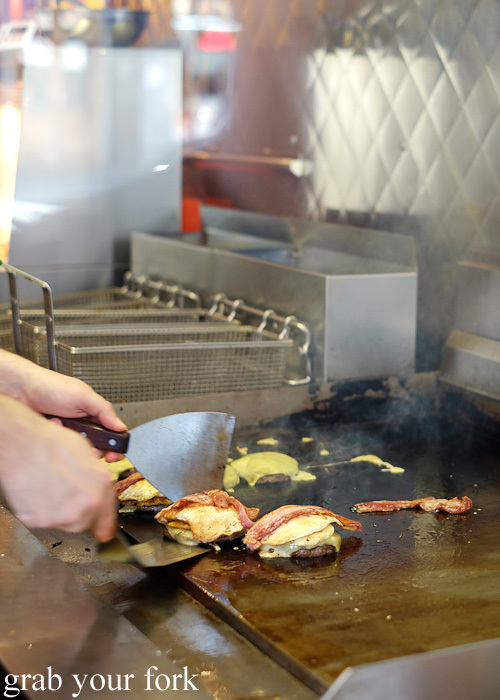 There are more questions to answer with each order, like deciding on how hot you want your batter. Stick with Southern for plain batter or get on the chilli train that runs from medium to hot, really hot and the expletive-ridden "really f**kin* hot". And then you have to decide if you want extra sauce on the side too. They've got mini tubs of Mississippi Comeback, Belles ranch dressing and Belles blue cheese for $2 a pop. The chicken comes out in plastic baskets lined with squares of greaseproof paper. Sure there's cutlery on the table, but don't go looking for plates. We end up eating the chicken the best way we know how: with our fingers, tearing into the piping hot chicken with our teeth. It's a hot juicy mess that will leave you grinning from ear to ear even as chicken juices run down your chin. We found some chicken a little oily in parts, but there's a wicked seasoning to the chicken batter. We ordered variations of medium and hot chicken, but couldn't pass up at least one order of the really f**ckin* hot version. It's a deep red in colour with a chilli pepper burn that builds steadily with each mouthful. You'll definitely feel alive after eating this stuff! I survived one piece okay but was glad I was sharing this serve with others. The mixed pickles kept our palates cleansed, and the mac and cheese provided some tongue-tingling relief. We debated about getting the ballet bucket: 16 wings, 4 sides and 2 sauces for $60. 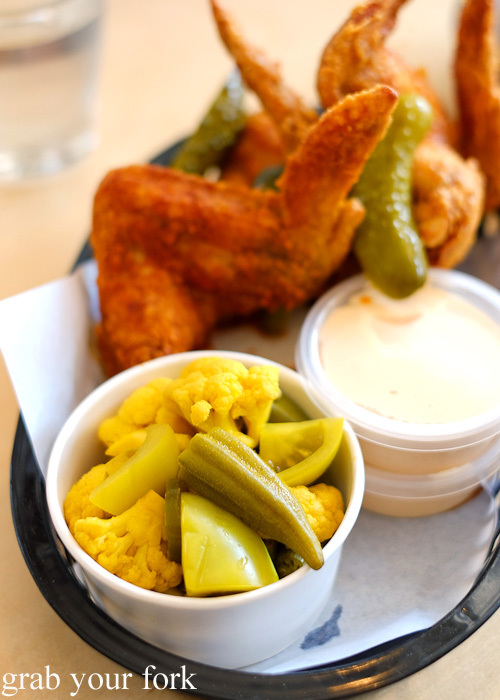 We wanted to have room for the fried chicken and waffles though, available at weekend lunchtimes only. The waffles are fat and fluffy and dusted with icing sugar. You can choose which chicken you want here too - we went with the dark meat which means a chicken leg and a thigh. 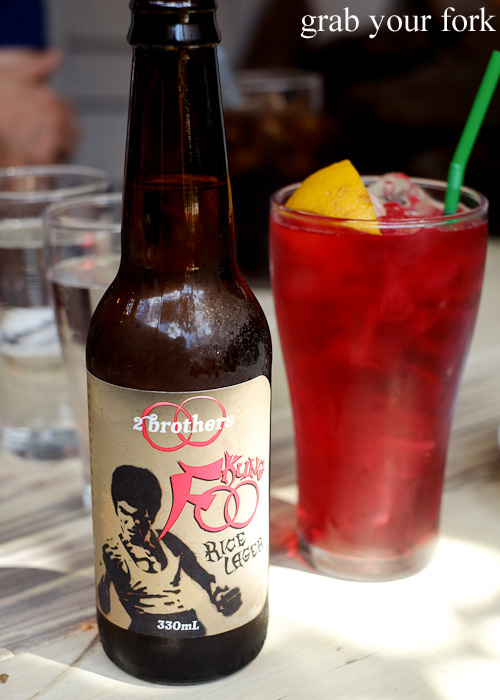 Drench everything with maple syrup and you've got one helluva weekend high. 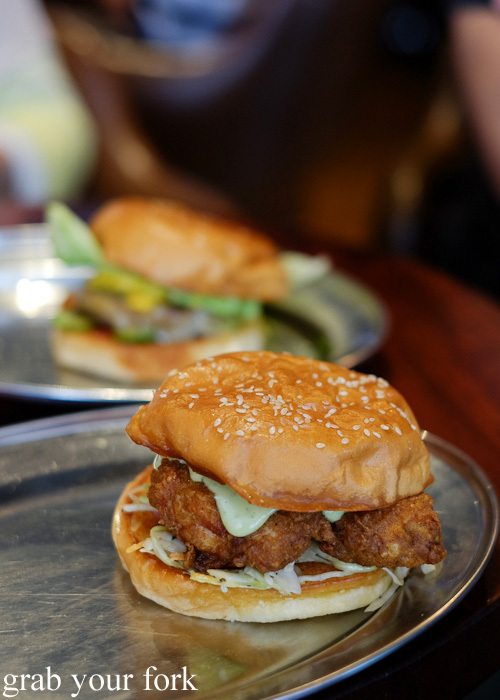 After stuffing ourselves with fried chicken, we headed down the road to Huxtaburger. 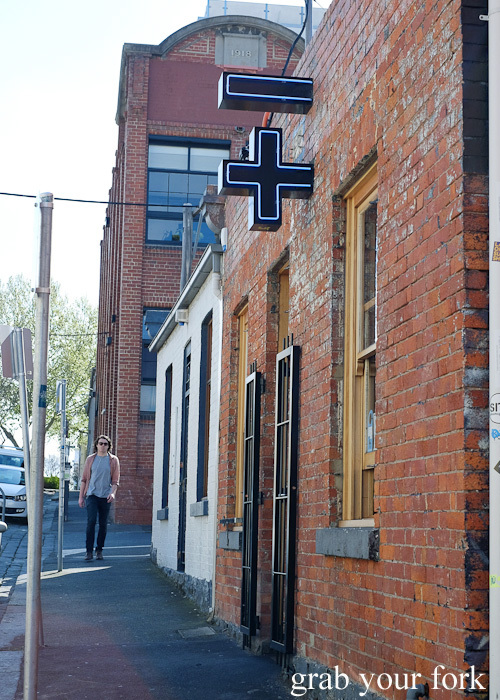 The Fitzroy / Collingwood precinct is probably my favourite area in Melbourne right now. The place is jam-packed with cool and interesting eateries and we spent most of Saturday eating at as many places as we could. We spent several minutes just staring through the window at Huxtaburger, watching the relentless production of burgers for hungry customers. There are tables and chairs on the footpath, but there's also a small indoor dining area to the side. 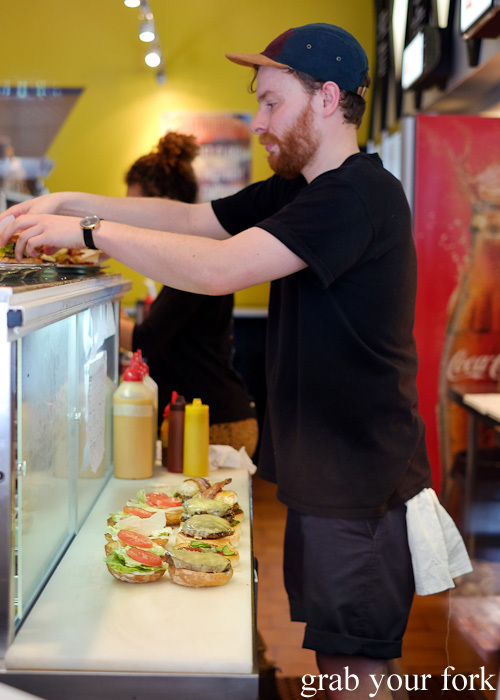 We go straight for the classic Huxtaburger, a regular inclusion in lists of Melbourne's best burgers. The layer of melted cheese on the beef patty is enough to make my heart skip a beat. 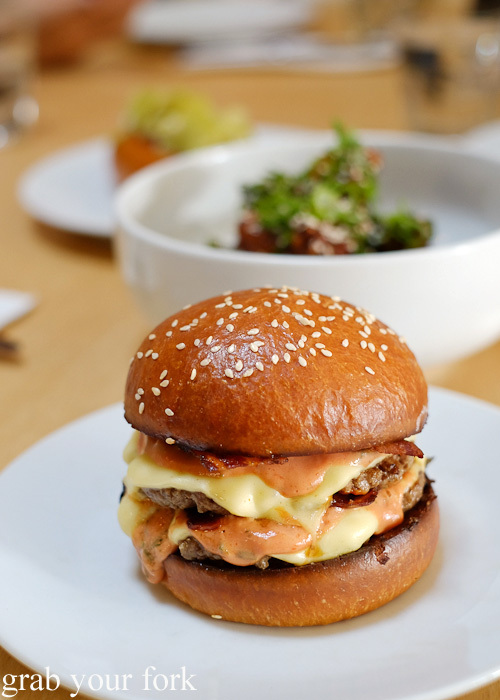 There's so much to love about the Huxtaburger. The toasted bun. The tangy mustard. The thick juicy hunk of beef patty. I like extra thick patties so they still have a touch of pink in the middle. And there's enough salad here - lettuce, pickled cucumbers and tomato - to lighten any sense of meaty excess. We also check out the Clair, a Southern fried chicken burger that is impressively juicy. The crunchy fried chicken is slathered with jalapeno mayo, the entire lot resting on a bed of crunchy slaw. 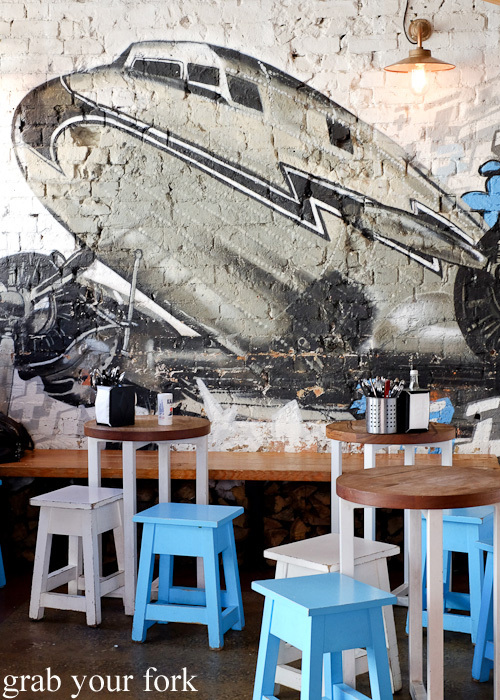 A few blocks down the road is Jimmy Grants. I'd eaten here before but my friends hadn't, so we stopped in for a quick bite of the classic souva, aka the Mr Papadopoulos. 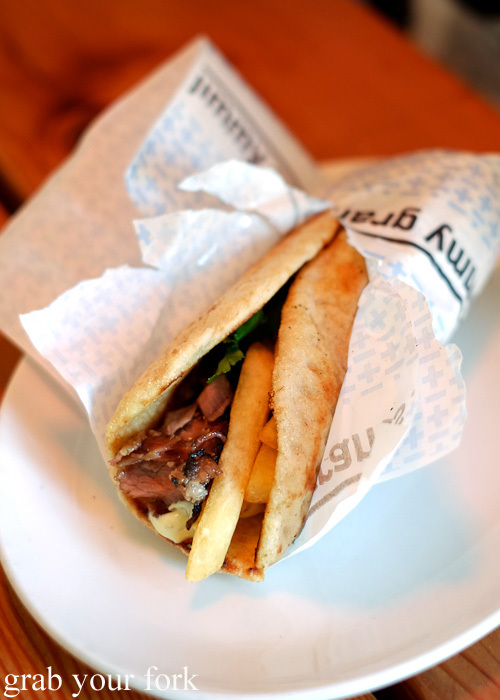 It's just as good as I remembered, the warm round of fluffy pita bread wrapped tightly around fatty slices of lamb souvlaki, hot chips and salad. If you ever needed proof that good things come in small packages, this would be it. We also returned here after a brief detour for one of their Jim Jams for dessert. 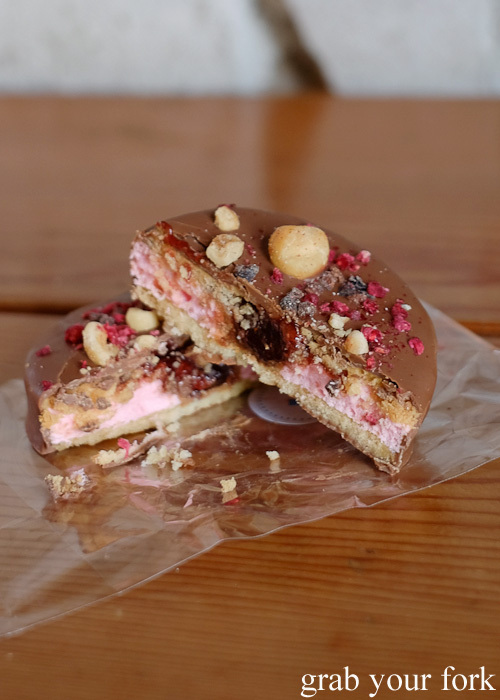 Jim Jams are Jimmy Grants' take on the classic Wagon Wheel, two biscuits sandwiched around marshmallow and covered in chocolate. It's all a bit fancy here with freeze-dried raspberries and hazelnuts embedded in the chocolate on top. It's also ridiculously delicious, not overly sweet, with a blob of raspberry jelly in the marshmallow core. Six dollars seems exxy for a biscuit a first, but it's so damn tasty we quickly change our mind. 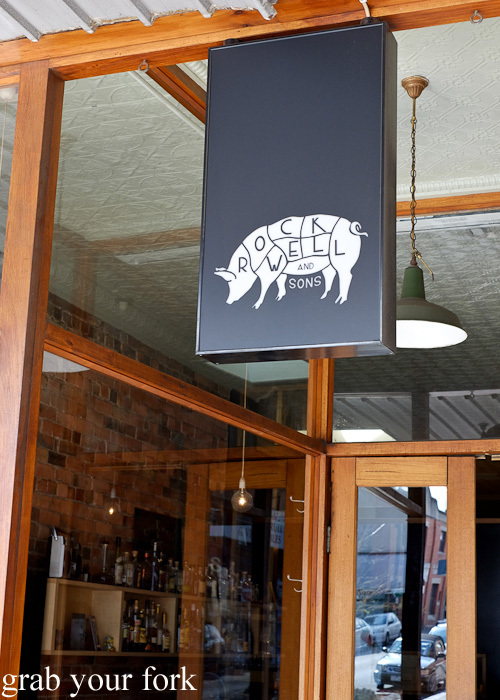 I'd been to Rockwell and Sons on my last visit to Melbourne, but was keen to try more things on the menu. Their fried chicken and biscuits still remained a beautiful memory. We dig into the Maine-style tiger prawn roll, its exquisite perfection belied by its simple appearance. 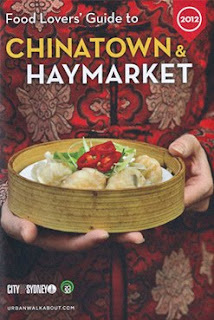 The bun is soft and comforting, an ideal vehicle for the huddle of plump tiger prawns doused in Kewpie tartare. The prawns are wondrously sweet and the tangle of compressed celery on top provides a hint of acidity and a contrast of textures. We can't resist ordering the crispy confit duck wings based purely on novelty value. There's not a lot of meat to these wings as expected, but the sticky, sweet and salty red dragon sauce is finger lickin' good. 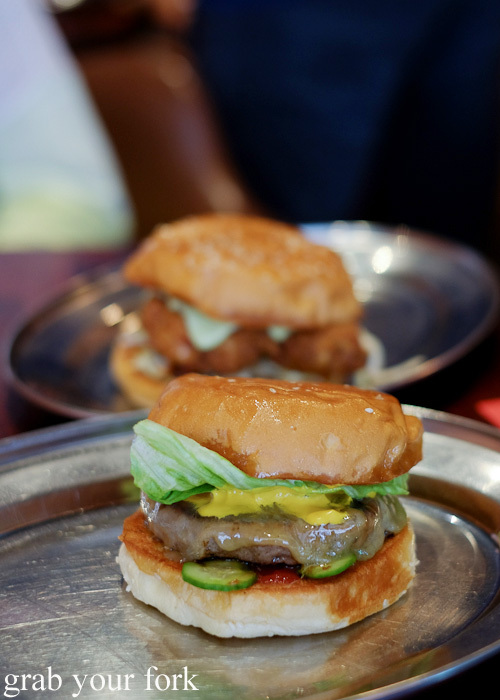 We're all over the double patty smash burger too, another heavy weight contender for Melbourne's best burger crown. And extra four dollars scores you three rashers of crispy bacon. These are American-style rashers, impossibly thin and brittle, that snap into shards with each bite. 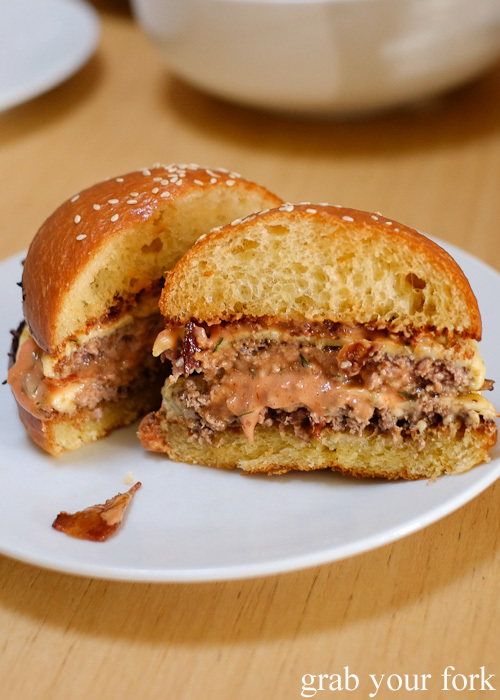 Sink your teeth into the toasted brioche bun and you'll meet two thin beef patties cloaked with melted Kraft cheese, special sauce and those precious strips of bacon on top. The bacon adds a fantastic smokiness. 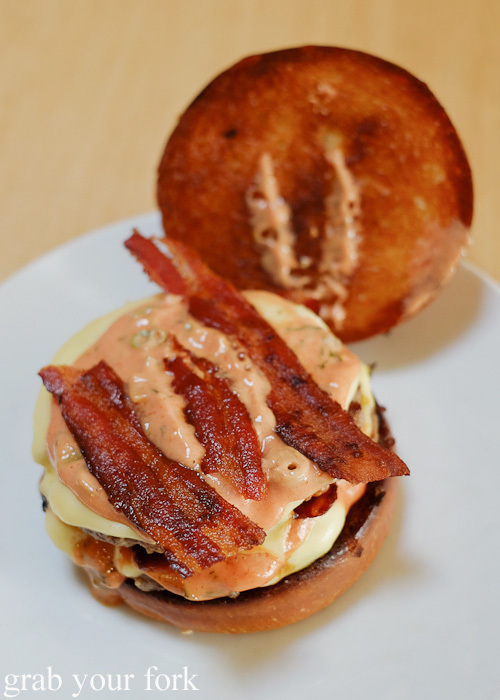 It's a burger for meat and bacon lovers, with an intensity factor way off the charts. 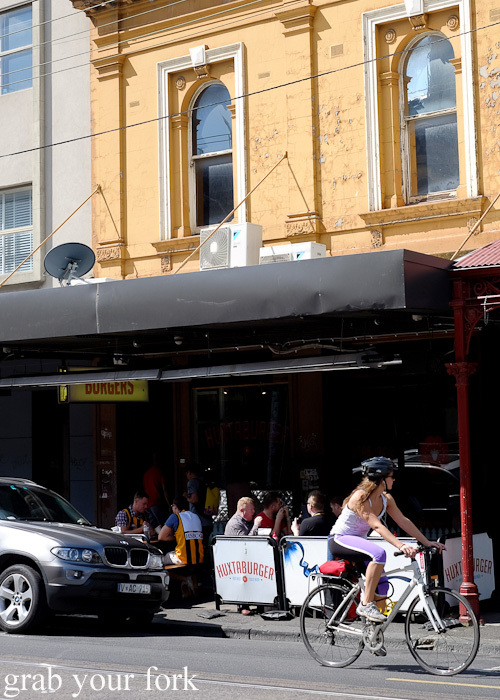 And the best thing about Fitzroy? 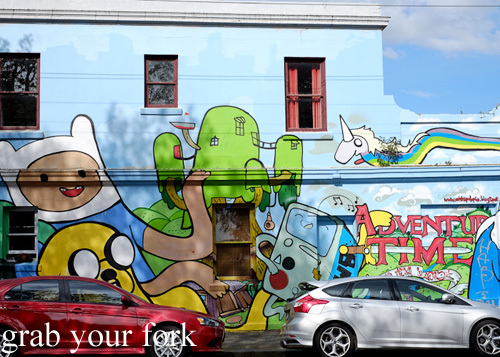 Stumbling into all kinds of street art including this awesome Adventure Time mural! 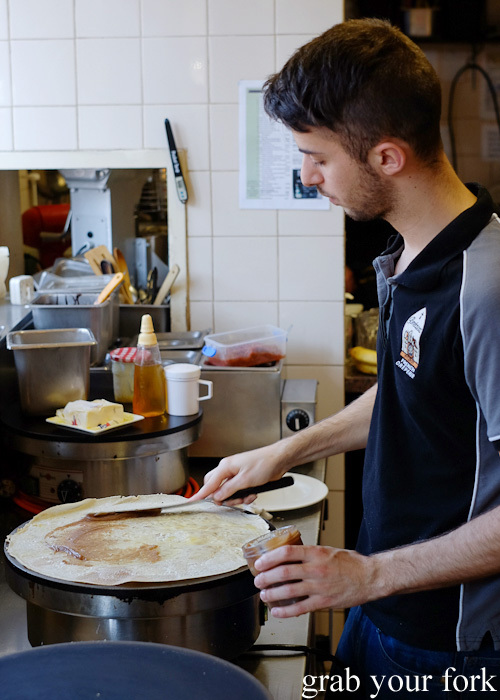 I think I've also discovered my new favourite crepe place in Melbourne too - Breizoz French Creperie just across the road from Sonido. You can smell the sinful aroma of butter and sugar whenever you walk within a few hundred metres of Breizoz. I've always meant to visit here but have either been on my way to a meal or have just finished eating one and am too full. It's definitely worth prioritising some space in your stomach though. 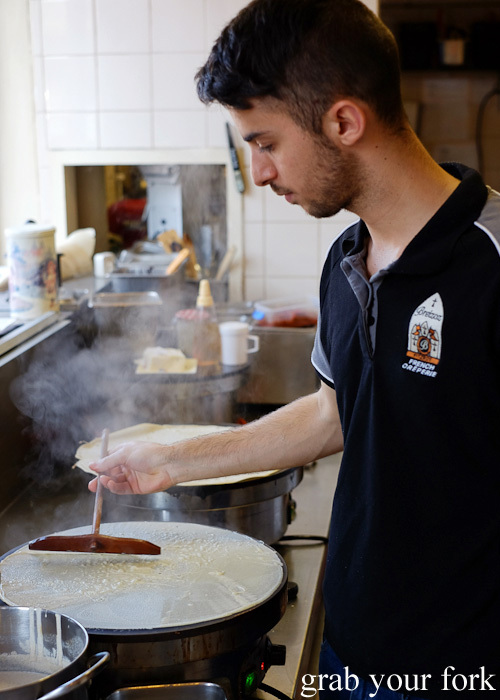 They make all their crepes with buckwheat flour and have a huge range of savoury and sweet variations. There are tables and chairs on the footpath, and a couple of tables inside. 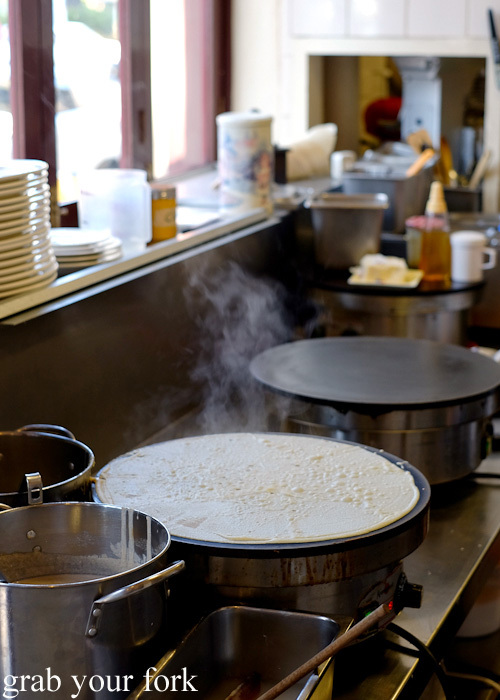 Either way, you can always watch your crepes being made in the open kitchen. The dexterity involved in flipping such giant thin crepes is quite a show. 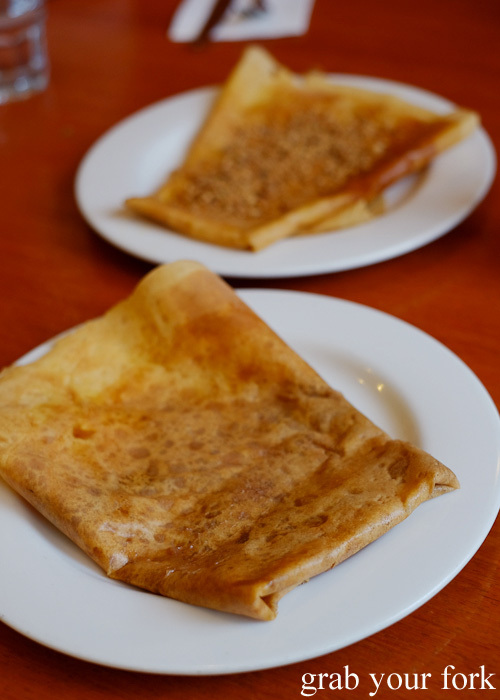 If you like super thin crepes with crispy edges, you'll love Breizoz. I continued my obsession with chestnut cream crepes, but really we're all secretly fighting for more of the crunchy edges. I love the deep golden colour of the crepes, and the glossy sheen to its surface. 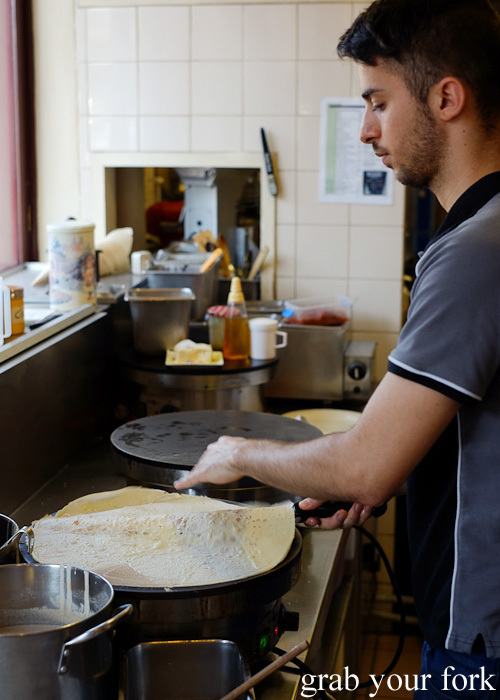 If you do watch the crepe production in the kitchen, you'll see the crepes being blessed with a cube of butter across its surface. 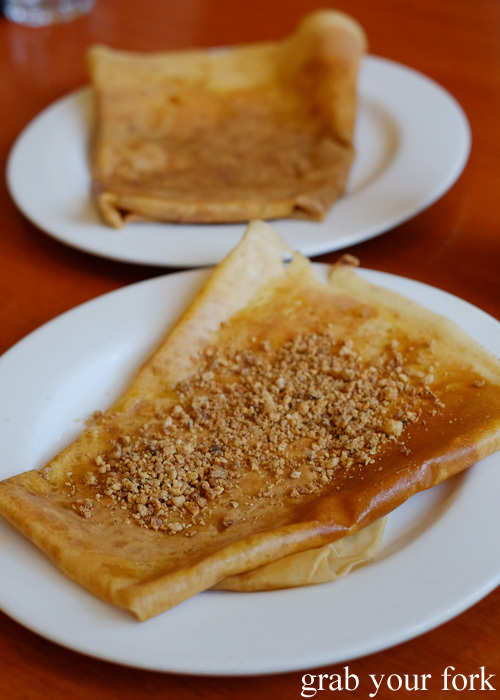 The crepe with almond praline is a surprise hit too, the folded crepe covered in smithereens of almond praline. It's nutty, crunchy and elegantly sweet. 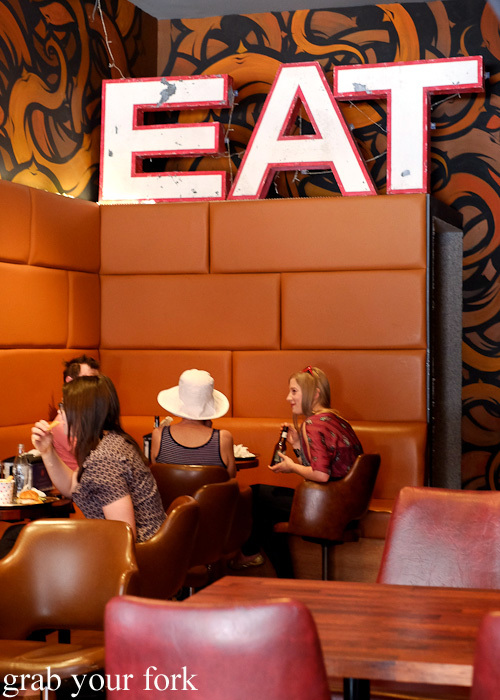 There's been a huge explosion of American barbecue places in Melbourne, so many in fact, that I had to decide between half a dozen specialist US barbecue joints. I ended up choosing Bluebonnet Barbecue and I'm glad I did. There's a genuine sense of heartfelt hospitality here, from the friendly waitstaff to the outdoor dining area out the back that feels just like someone's backyard, complete with fairy lights and an outdoor dunny. 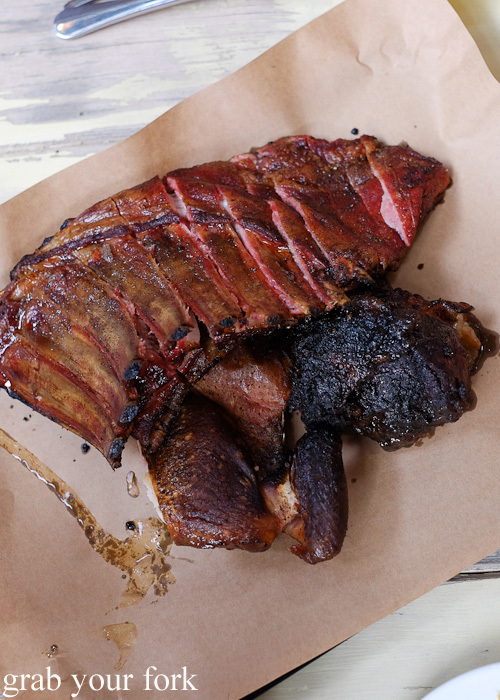 Executive chef Chris Terlikar worked in Michelin-star restaurants before making the switch to American barbecue. 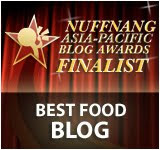 It was a meal at New York barbecue house Fette Sau that was the turning point. 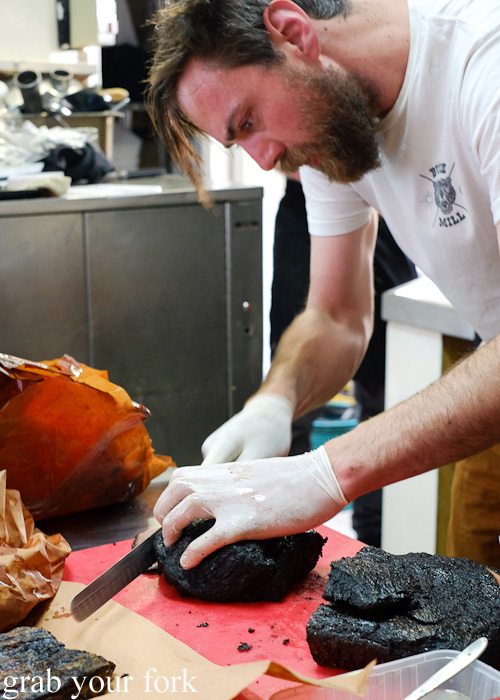 He ended up travelling around Texas for eight weeks undergoing intensive tutelage on all things barbecue before returning to Melbourne to open Bluebonnet. 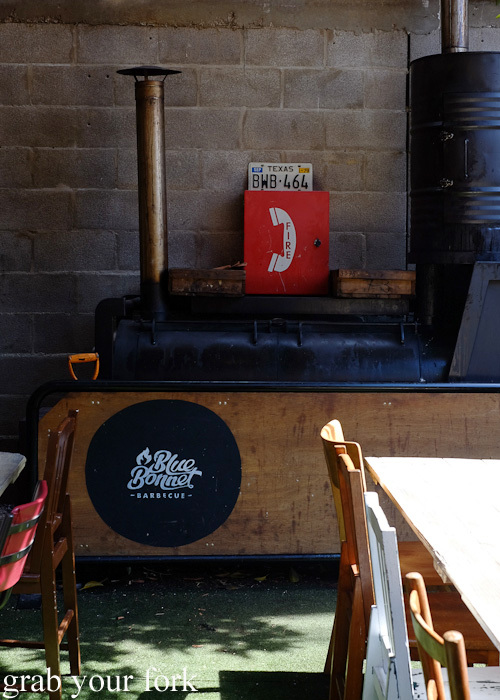 The smoker out the back used to be a smoke machine from a nightclub at Crown Casino that Chris found in a junkyard. It was cleaned out and turned into a customised firebox smoker, cranking out barbecue meats non-stop except for a two-hour break from 10pm til midnight. 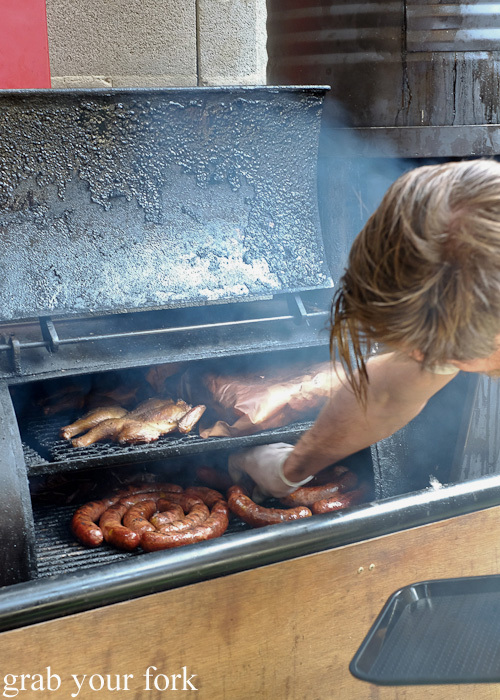 They use iron bark wood from the Blue Mountains in the smoker. They tried all types of woods before eventually settling on iron bark because of its slow-burning capabilities. It also maintains a regular temperature as it burns. Meats are ordered just like they do in the States, by the pound or half-pound. One pound is about 450 grams for anyone still wondering! 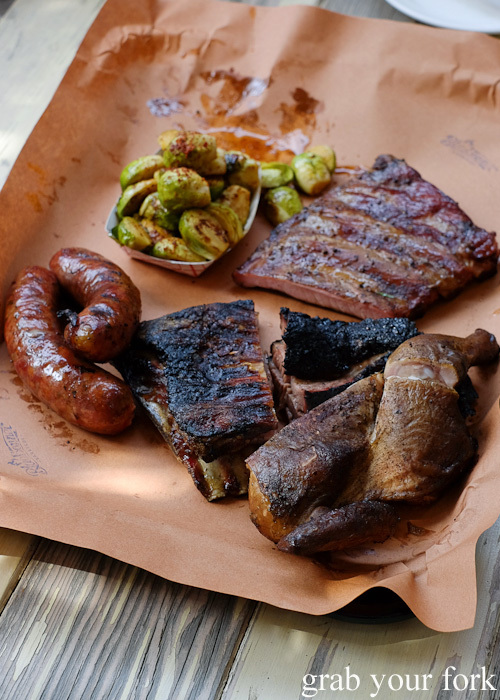 The meat is loaded up on a brown paper-lined tray. You do get plates here, and a huge squeezy bottle of their housemade barbecue on the side. It's all good. Today's housemade sausage is beef stuffed with cheese, so hot from the oven the cheese squirts out with ferocity. 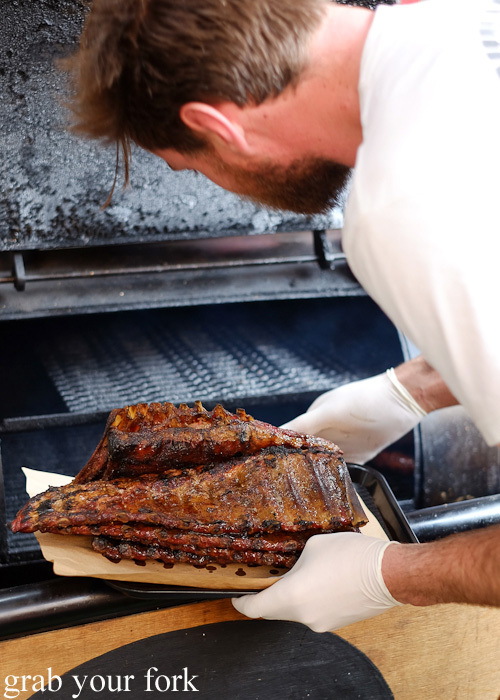 The pork ribs are cooked for three to four hours, and so tender the meat falls clean the bone. The brussels sprouts still have some bitterness to them but the lemon miso dressing is so good you could drink it with a straw. It reminds me of the prawn head juices you get after grilling prawns on the barbecue although I just get a strange look from staff when I mention this to them. The brisket is cooked for eight hours, and the blackened sheath around its surface looks the business. 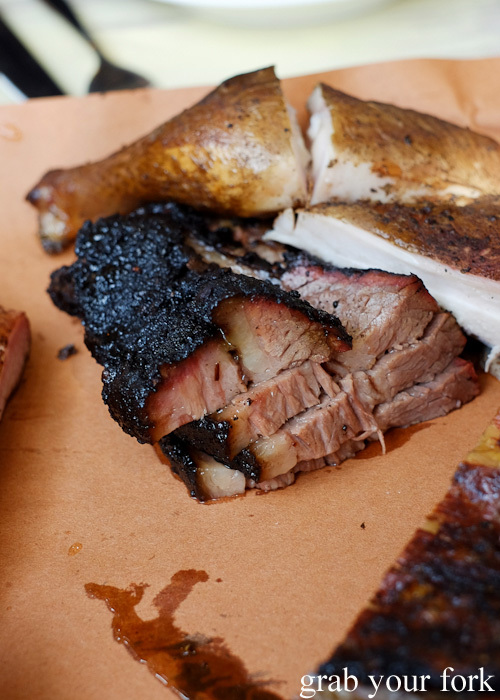 It's intensely smoky at the edges, and the meat is juicy with precious layers of fat that taste gloriously good. There are lots of sides to choose from, including warm kipfler potato salad and broccoli with fetta and smoked almonds. 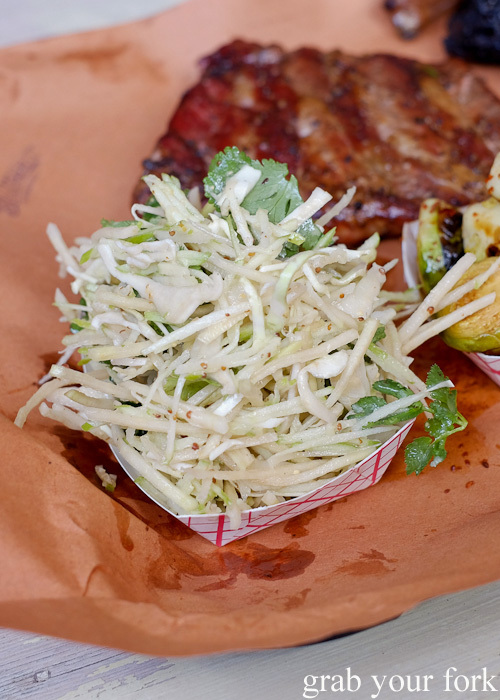 The apple and kohlrabi slaw is the right level of sweetness and crunch to provide welcome refreshment. We'd been hesitant about ordering the smoked chicken but do so on recommendation of our waiter. It's just as good as he said it would be. 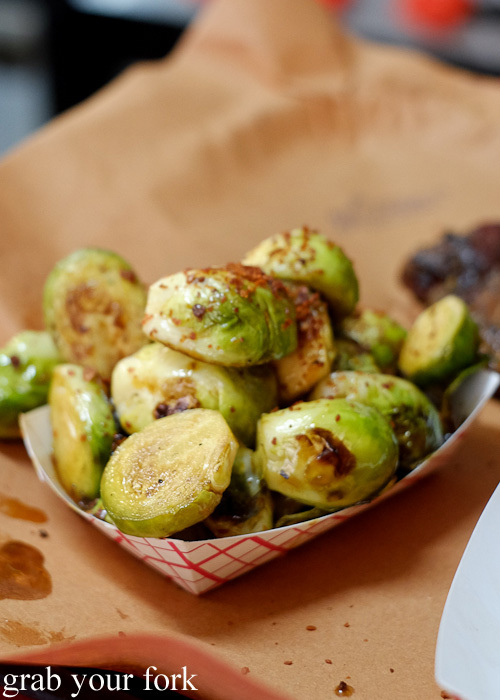 We're so swayed by its succulency that we end up ordering another half pound. We also can't get enough of the lamb ribs. These are a life-changing moment. They've been cooked so the fat has rendered its way throughout the meat but it's the skin that has our eyes rolling to the back of our head. 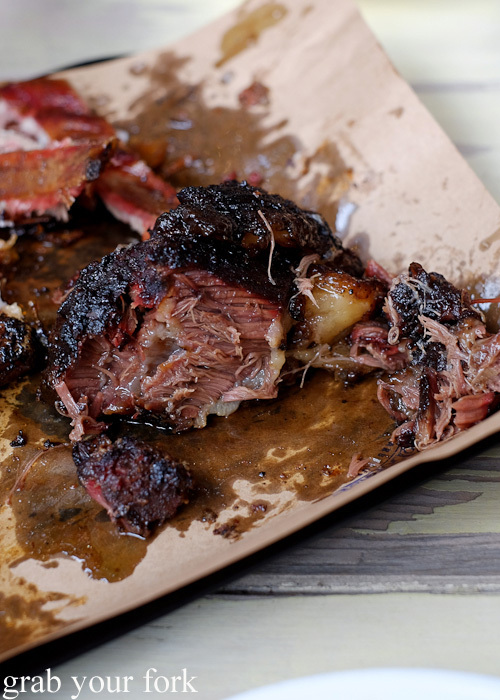 It's crispy and smoky and brittle and fatty and it's so darn amazing we order another pound to share. We also get the smoked porter braised beef cheeks on our second round. The meat is so soft, you only need a fork to coax it apart. Oh Collingwood. I can't wait to meat you again. As a melbournian, I'm loving reading your posts lately. 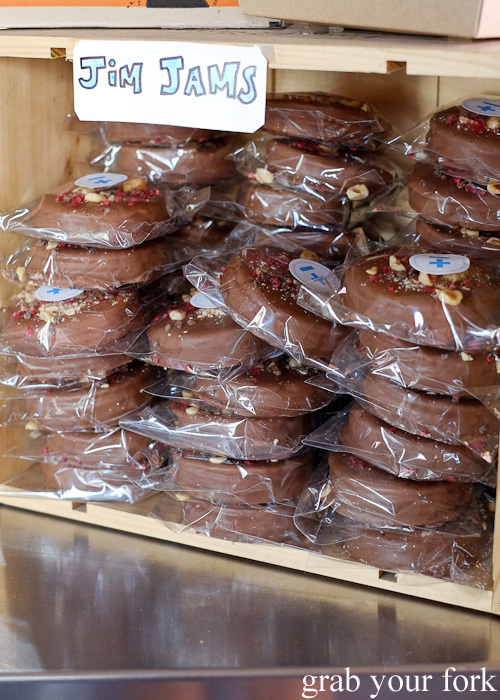 Interesting note: the Jimmy Grant's wagon wheels used to be made by Burch and Purchese in Chapel St, but now they are made in-house, sothe trecipe had changed. You can still get the other ones from Burch and Purchese though. Those fried chicken wings and burgers look like would massacre the ones at Mary's. And damn I'd roast those sprouts at home if they taste like prawn heads! Wow all that dude food! I've actually never tried fried chicken and waffles.. should really tick that off my list soon! Hi Anon - I actually noticed the wagon wheels at B&P and thought they looked very similar! We also saw wagon wheels at Beatrix. I had no idea that Melb was so obsessed with them at the moment! Hi Chopin - It was the miso dressing. It really did taste amazing! This is the most amazing list of comfort dirty food! I'm drooling just looking at the photos. Oh damn, my belly hurts at the mere thought of cramming all that food into a short trip south. I love the coasters at Belle's. The guy on the left looks like a hipster version of Colonel Sanders! 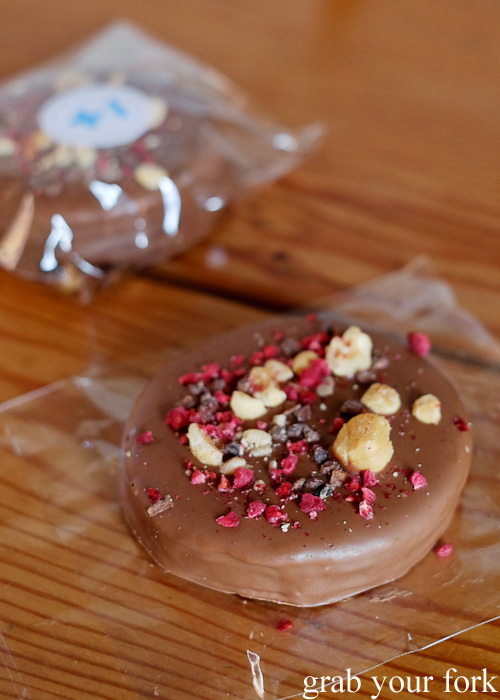 I gotta hit up Belle's fo shizzle on my next Melb trip!! The classic Huxtaburger is still my favourite hamburger to date! Already booked in to Bluebonnet for my trip down in a fortnight, I hadn't even heard of it, then I saw Suze's Instagram post and knew I had to go! 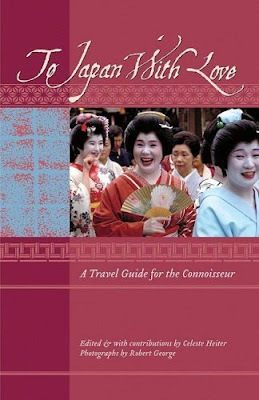 Your trip's certainly been inspiring but I only have 44 hours down there and no food blogger stamina! Plus I've got old favourites and places friends want me to go, so just picking and choosing a few places. belle's fried chicken oh man i have dreams about it and have been stalking airlines for cheap flights to duck down for the weekend and eat nothing but fried chicken. aaaand maybe a donut. Soooo much food!! I just can't stop looking at Belle's chicken! Whoops! I think I just gained extra pounds by looking at all the food!!! I like the look of the chicken - crispy and tasty! Plus, the Jim Jams seem to be calling me! Wow you know how to tour girl. Thanks for th e peak around Collingwood. Belles is on my wishlist for my next visit to Melbourne. Looks amazing! 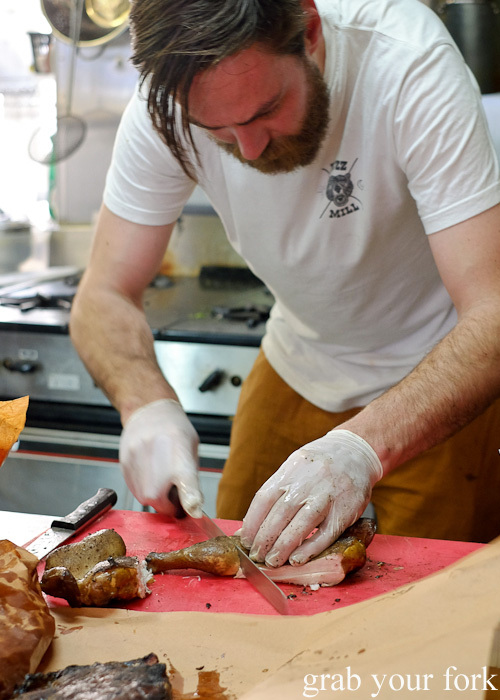 It's interesting how Aaron Turner has gone from fine dining (at Loam) to fried chicken, kinda like the path that Luke Powell has taken at LP's. 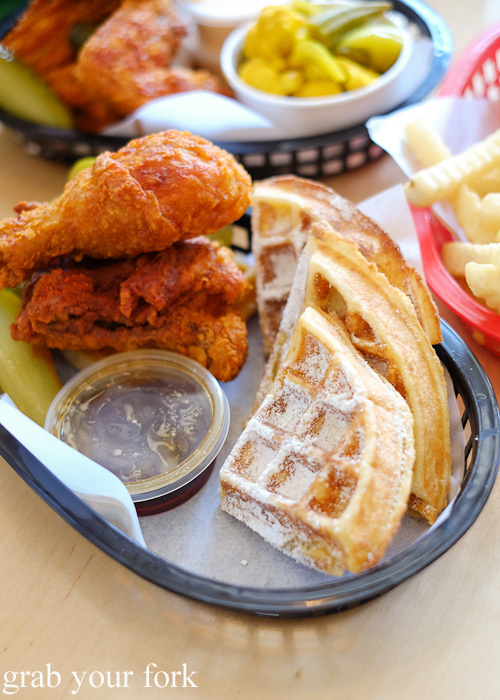 Needing a trip to melbourne & a serve of chicken & waffles, with Mac n cheese for sure. Next time, just stash me in your handbag and feed me a Jim jam!!! They look so awesome! My goodness what amazing eats?! 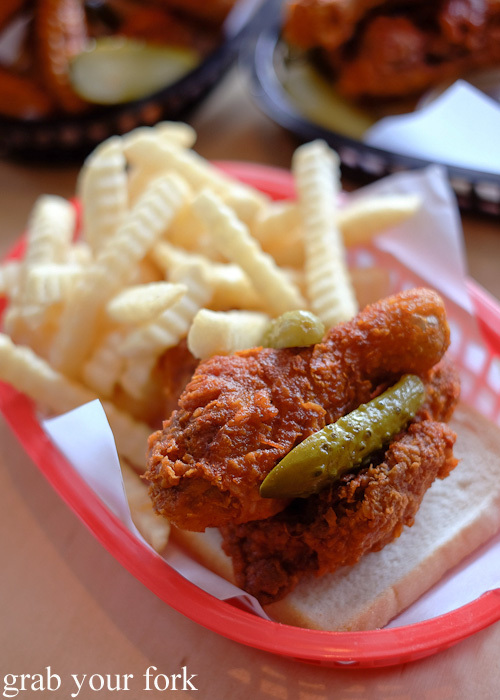 I'm loving the fried chicken at Belle's Hot Chicken. Absolutely putting it on the Melbourne list. I really want to go back to Melbourne!! drooling at all the fried chicken! 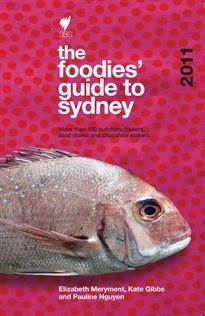 so much more melbourne eats to add to the list lol. 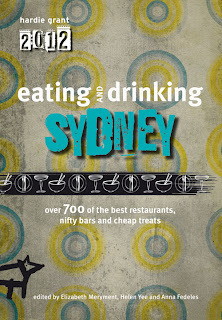 I love Melbourne and am heading there in January for the tennis so I will be sure to try some of these places. 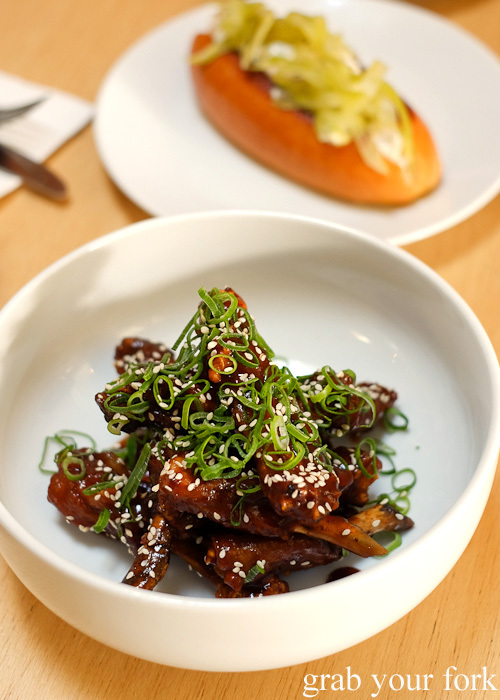 Melbs really does do good food. 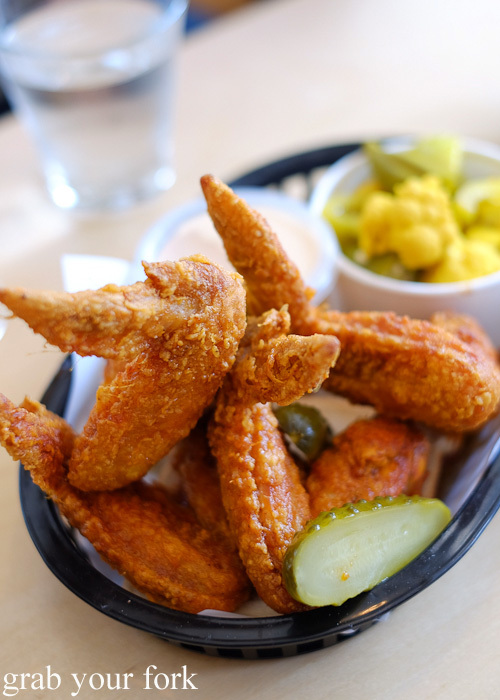 I'd kill for some of the hot chicken wings right now! And them brisket! oh my, the fried chook looks good, i love their coasters! and the brisket.... where do i start?!?! I need a ticket to Melbourne. STAT. Trust you to find somewhere that is a fried chicken mecca. 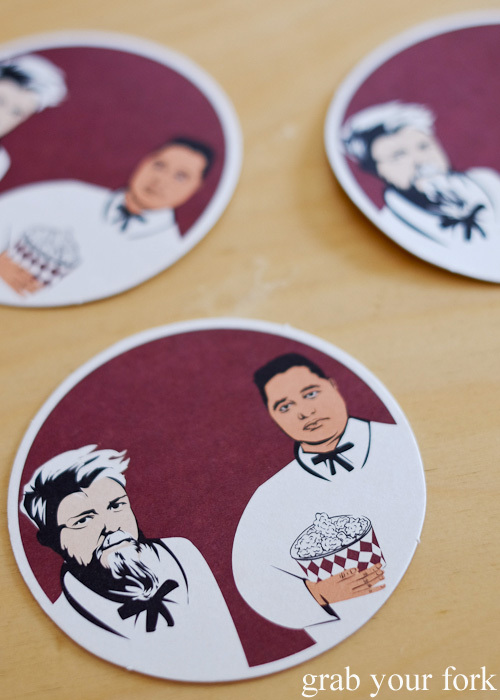 Love the coasters. I was in Melbourne earlier this month too, and visited Belle's Hot Chicken after seeing your instagram picture. YUM!! Loved it. I have no idea how you managed to fit in Huxtaburger after that though.